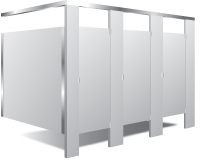 Designed for use in commercial, industrial and institutional facilities, Decolam sanitary partitions are ideally suited to high-humidity environments such as swimming pools or high-vandalism areas such as prisons, schools or high-traffic public areas. These panels are made of multiple layers of kraft paper impregnated in phenolic resin. The assembly is done using a special process, resulting in a highly resistant material. The layers are pressed together at an intense heat, so they fuse to form an incredibly strong, homogeneous and water resistant material. This allows resistance to vandalism, oil staining, fungal growth and cigarette burns. rust nor require any repainting. To clean, use a damp sponge or rag. Tougher marks can be removed using household solvent. 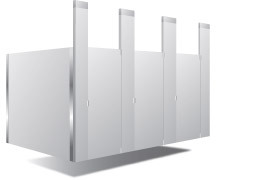 These panels are constructed from a plastic laminate hermetically bonded to a 45 lbs. density particleboard. The 50 mm (2″) solid phenolic edges prevent moisture penetration and ensure greater strenght to install hardware and accessories. NOTE: Panels in all options come in a wide variety of colors, patterns and finishes. Scratch- and graffiti-resistant, they are easy to assemble and maintain. Our standard partitions meet NFPA, Class B and UBC Class II fire standards. 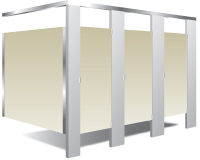 Fire-resistant partitions are available on special order. This type of partitions is the most widely used. It works well in both newly constructed and renovated buildings. The headrail provides a sturdy, practical structure that is ideal for busy locations like schools and public places. 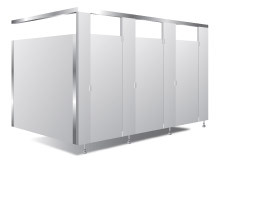 This type of partitions is necessary in locations that are very busy and where the installation of a headrail is not recommended, such as prisons and several hospital aisles. A solid structure from floor to ceiling is required. This type of partitions is convenient in public places such as office buildings. It keeps the floor completely free of obstructions, which enables easy floor cleaning. 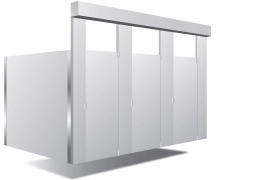 However, these partitions require a ceiling mount system (see attachment details, two types available). This type of partitions is ideal for locations where the ceilings are non-standard. It is also preferred for its contemporary style. A 2″ thick cement floor is the minimum requirement. This type of partitions was first used by Decolam. It keeps both the floor and the ceiling obstruction free. It is necessary to install a structural beam that crosses the room and that is supported on cement blocks. 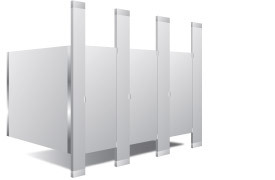 These European-style panels are supported by stainless steel, adjustable bases. 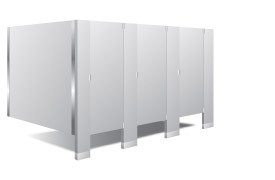 The front is free of obstruction for easy cleaning, and the panels and doors are 1 800 mm (70″) high for maximum privacy. 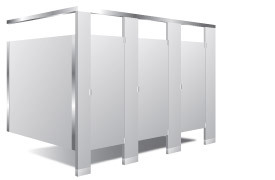 DECOLAM is proud to introduce a new and improved version of its partition doors for washrooms, bank cubicles, polling booths, fitting rooms, and showers. The new partition features the PRIVACY PROTECTOR—a strip of black polypropylene felt embedded on both sides of the partition door. 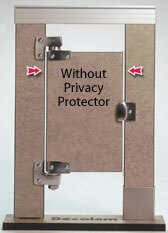 This innovation completely eliminates any undesirable openings to allow for total privacy. 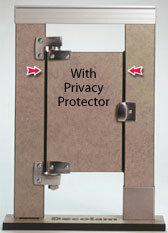 The Privacy Protector is now available with all DECOLAM washroom partition doors on request. Durable and discreet, it’s a great way to enhance product value. Once again, DECOLAM leads the way with innovative, quality products designed with the consumer in mind. Success Stories: More than 500 projects per year! Other projects: Schools · Airports Prisons · Hospitals · Restaurants · Shopping centres · Industries, etc.